… ‘I write this sitting in the kitchen sink‘ would be a more appropriate start given the topic of frugality, but that wonderful first line has already been taken – plus it would be a big fib. The bar in question has a black cat pictured on the menu, and a real black cat called Tahita who likes to have her ears tickled. It is a local’s bar, where no English is to be heard and the food and wine are cheap and good. I am very lucky that it is just across the road from my apartment building; most of the other options are the typical ‘Brit abroad’ Irish Bar or expensive seafood restaurants. Anyway, back to ‘I write this sitting in a Spanish bar with a black cat‘; it was the perfect setting for some diary writing – a favourite holiday occupation of mine along with reading, eating, drinking and sleeping. Holidays are a good time for reflecting, and writing has always been my favourite way to put my thoughts in order. I decided that my musings from this morning were worth typing up and sharing with you, given that quite a proportion of this blog is about frugal eating. I read an article this morning about a lady who gave herself a ‘spending break’ for a whole year – that knocks my January Challenge of £5 a week for food into a cocked hat! Having said that, I suppose that what she has done – allowing spending on only mortgage, bills and groceries – is similar (although rather more strict!) to the rule I gave myself when I was made redundant in February. The bank account which my redundancy money went into I only allowed myself to use for my mortgage and for bills; the only money which I allowed myself to spend was that which made it’s way into a different account from temping work and making and packing lovely meringues for my friend Lisa. I have kept to this rule rather well until the last month or so. Not bad. On reflection, the problem with my redundancy money rule was that anything which made it into my other account I was allowed to spend on myself in what ever way I wanted, and so I lost much of the discipline learned during my January Challenge. Also, the January Challenge concerned only food rather than a wider ‘frugality’, which led me to reflect this morning on what other things I spend money on which are not strictly necessary. The things that most quickly came to mind were wine, gin and ‘lazy food’ – so still pretty food related! What is it they say about putting your money where your mouth is?! I had to put rather more thought into where the rest of my money is frittered away to. … and now to repair to another Spanish bar for wine and tapas. 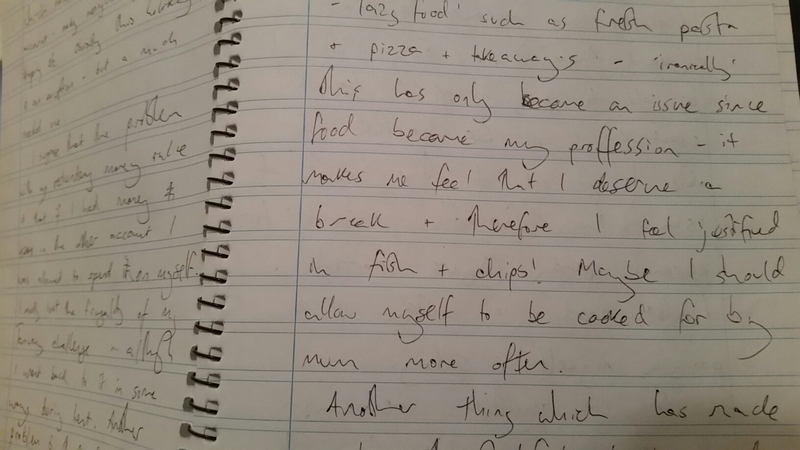 I will finish typing up my musings tomorrow – providing that I can still read my handwriting ! The recipe was handed down to my friend Hannah by her mother. I had to text Hannah in a panic asking for the recipe when my chocolate cake failed, however I have since found my old copy and I think I will leave it to Hannah’s mum to instruct you. All that I need to add is the decoration. This was done after the cake had cooled in the fridge over night, and was simply melted chocolate with raspberries and flaked almonds scattered on top.